THE Ministry of Defence has stressed it is ‘committed to building’ the navy’s next generation of frigate. The statement comes amid fears over the Type 26’s future. Yesterday, union group GMB said up to 800 jobs at BAE Systems’ Scottish shipyards could be in the firing line if the government was to pull back on its commitment to build eight of the new frigates on the Clyde. 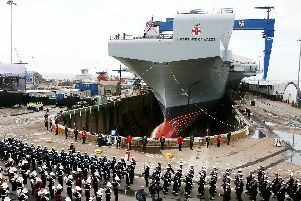 However, responding, a spokeswoman for the MoD said: ‘Over the next decade, we will spend around £8bn on Royal Navy warships. The Type 26 will replace the aging Type 23s – six of which are based in Portsmouth.